(Nanowerk News) Mapping the internal atomic structure of small particles just got easier thanks to a new computer algorithm and graphical user interface (GUI) developed by scientists at and Lawrence Berkeley National Laboratory (Berkeley Lab) and University of California, Los Angeles. The advancement brings a new tool to the field of electron tomography that the researchers hope will expand the usefulness of the techniques they use to assemble detailed 3-D images of objects by scanning them with a beam of electrons. Tomography allows researchers to look inside a material and study its internal structure, like with X-rays and MRIs (magnetic resonance imaging scans) in medical science. Atomic electron tomography (AET) has become increasingly important for precisely characterizing a wide range of materials at the single-atom level. 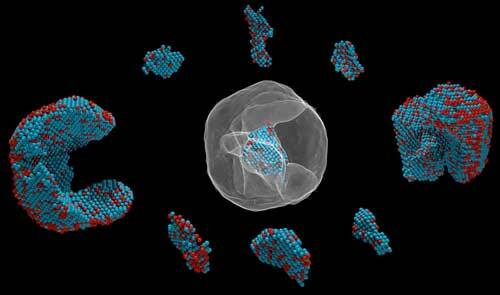 “Unlike biological structures, in materials science every nanoparticle’s structure is unique – like a snowflake – at the atomic scale,” said Peter Ercius, staff scientist at the National Center for Electron Microscopy, a facility at Berkeley Lab’s Molecular Foundry. “With the 3-D coordinates, you can start learning about the precise atomic structure and how that structure gives a material its properties.” The Molecular Foundry is a nanoscale scientific research center that is open to visiting scientists from around the nation and world. To help make AET more accessible and widely used, in October the Molecular Foundry will host a four-day event featuring a two-day workshop and two-day short course, “Frontiers in Electron Tomography”, that will feature discussions and hands-on training for these new techniques. Registration for the event ends September 15.